Samsung announced its Galaxy Note9 smartphone this morning during its Unpacked event in Brooklyn, New York. The Galaxy Note9 is Samsung’s largest smartphone model to date, with a 6.4-inch screen, and it comes with an S Pen stylus. The Galaxy Note9 runs on the Qualcomm Snapdragon 845 processor that powers most high-end smartphones in 2018. It also has a minimum of 6GB of RAM – with an option to go up to 8GB – which should make for smooth performance. Noteworthy is the Galaxy Note 9’s 4,000-mAh battery – that’s large for any smartphone and should give it superior battery life. And yes, you’ll be able to play Fortnite: Battle Royale on it. Both cameras in the dual-lens system have 12 megapixels. You can read more about what’s inside in our full rundown here. Samsung Electronics Australia says the new smartphone is available to pre-order from today for $1,499 (128GB) and $1,799 (512GB). You can find it in three colours – Midnight Black, Ocean Blue and from select retailers, Metallic Copper. Most retailers will also offer a free upgrade to the 512GB version if you pre-order the 128GB version. The Galaxy Tab S4 and Tab A 10″ are also available to pre-order from today and will also go on sale on August 24, 2018. You can pre-order them from Samsung online store and Samsung Experience Stores, as well as retail and operator partners. The Tab S4 will be available in 64GB from $979 (wifi) and $1179 (4G). The 256GB model starts at $1179 (wifi) and $1379 (4G). Bot come in Ebony black and Fog Grey. The Galaxy A 10.5” tablet will go on sale in Australia from Friday September 7 from $449 (wifi) and $649 (4G) in Ebony black and Fog Grey. Pre-orders are now live on Telstra’s website and the actual phones will be available from Friday, August 24. You can choose fron two colours at Telstra – Midnight Black and Ocean Blue – and two memory variants, 128GB and 512GB. Go for the 128GB option. Telstra customers pre-ordering the Samsung Galaxy Note9 will also score a free Galaxy Tab A 8.0 worth $456 as well as an automatic memory upgrade to the 512GB phone. Telstra is offering the Note9 on both mobile and mobile lease plans, including the $199 Ultimate plan with unlimited data. Optus is also offering the complimentary upgrade from 128GB to 512GB if you pre-order before 11:59pm (AEST) on August 23. 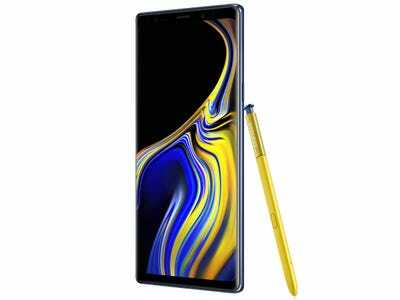 The Galaxy Note9 – again, Midnight Black or Ocean Blue – is available on Optus 24 month My Plan Flex (lease) for $85 per month, with $10 per month handset repayments (minimum total cost $2,280) and 20GB of included monthly data. While 20GB doesn’t sound like a pile compared to other offerings, it does include every match of the English Premier League, which starts this weekend, live, and pretty much every other major soccer league match for the three years. It will also throw in free data for streaming music services such as Spotify and Google Music. For an extra $5 a month, Optus will add unlimited data for Netflix, Stan and ABC iView streaming. The My Plan Flex also gives you the option to upgrade this time next year for $99 if you sign up to a new 24-month plan. But you have to hand over your Note9 and it must be in “good working order”. Samsung has confirmed that Galaxy Home – its entry into the AI-assistant powered home speaker market – is planned to be available in Australia at a later date. Pricing and availability will be announced closer to the Australian launch.